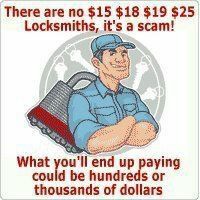 Sorry to tell you this, But if you are searching for a locksmith company that advertises they are $15 or even $25 locksmiths you will be ripped off. They use this tactic to get you to call them but when they arrive you will end up paying hundreds more. More than what a legitimate locksmith would ever charge you. What company in this day and age would be able to make ends meet if they only charged $15 to come to you and provide a service? It would cost more than that in fuel alone. The best thing you can do is to search for a legitimate California State Licensed Locksmith now while your reading this and program their phone number into your phone before an emergency happens and you find one of the scammers.